Many dog owners today are aware of the disadvantages that grains can have on canine health. Picking one of the best grain free dog food brands to avoid potential health issues from feeding your dog too many grains may be a wise choice for some owners and their pets. But why feed your dog grain free as opposed to regular diet? Grain free dog food brands have been all the craze for more than a decade now and that has resulted in plenty of best grain free dog food brands to choose from. While a grain-free diet isn’t ideal for all dogs, and a few recent studies from FDA found that grain free diets may cause heart disease in some dogs. For those with grain sensitivities, we recommend taking a look at these 50 best grain free dog food brands. * Click on the best grain free dog food brand for more information and prices, or scroll below for more details, notes and dog food reviews. The purpose of grain free dog food diet is to mimic your dog’s ancestral diet. Because dogs evolved to primarily consume meat (animal based protein), many experts argue that feeding dogs a similar diet today will keep them healthier and extend their lifespan. Best grain free dog food recipes are easy to digest for dogs, and the high percentage of meat protein and healthy fats, alongside low percentage of carbohydrates and no grains, may improve dog’s performance too. In fact, some scientific studies have shown exactly this to be the case. Note that grain free dog food doesn’t mean carb-free. All best grain free dog foods contain some amount of carbohydrates mostly made up of vegetables and legumes. Potatoes is a common type of carbohydrate in majority of the best grain free dog food brands. Below, we’ll discuss more about the pros and cons of a grain free dog food diet, and review fifty of the top rated grain free dog food reviews. With a whooping 50 best grain free dog food options to choose from, you may even find this list a little overwhelming. If this is the case, I recommend looking specifically at your dog’s needs. In addition to being grain-free, what else does your dog require? What preferences do they have as far as protein flavors? Which foods are more readily available to you? And most importantly, which food offers your dog the best nutrition for the budget you have at your disposal as discussed with your vet? Speaking of which, it’s crucial that you discuss your dog’s diet with a veterinarian. Grain free dog foods aren’t the top choices for all dogs, and not even for most dogs. In fact, many veterinarians argue against using grain free foods unless your pooch specifically needs a grain-free diet. So if you’ve already concluded that a grain free food would be a better option, then see the below top ten list that compares some of the most expensive grain free dog food brands; to see 40 more alternatives of the best cheap grain free dog foods, scroll down below past these top rated grain free dog food reviews. Starting off the list of natural, grain free top dog food brands is Orijen, a brand oft-recommended by veterinarians and pet owners alike. The company makes biologically appropriate pet foods from fresh regional ingredients. This is a dry dog food that is grain free and actually passed for human consumption. It contains a high amount of protein and a low amount of carbohydrate. Orijen grain free dog food brand also contains essential fatty acids from fresh-wild fish, which is an excellent source of omega-3 fatty acids. Your dog’s coat will thank you! It also contains prairie botanicals and vegetables, including sea vegetables, which offer the highest and best quality of minerals for nutrition. Orijen dog food contains no artificial flavors, colors, preservatives, or GMO ingredients. The brand makes several unique classes of dog food formulas. Orijen’s most popular dog food blends are made for every breed and size of canine, at every stage of life. There are nine formulas in the line, and they all offer 55-65% meat (chicken, eggs, and fish) and low-glycemic steel-cut oats. Other lines consist of four blends that reflect the diversity of fresh foods produced across Western Canada. They all feature 60% meat. Least popular Orijen dog food line is formulated for dogs with special diet requirements. They offer 50% Canadian duck, Alberta pork, New Zealand lamb. Ingredients: Deboned Chicken, Deboned Turkey, Yellowtail Flounder, Whole Eggs, Whole Atlantic Mackerel, Chicken Liver, Turkey Liver, Chicken Heart, Turkey Heart, Whole Atlantic Herring, Dehydrated Chicken, Dehydrated Turkey, Dehydrated Mackerel, Dehydrated Chicken Liver, Dehydrated Turkey Liver, Whole Green Peas, Whole Navy Beans, Red Lentils, Chicken Necks, Chicken Kidney, Pinto Beans, Chickpeas, Green Lentils, Alfalfa, Chicken Fat, Natural Chicken Flavor, Herring Oil, Ground Chicken Bone, Chicken Cartilage, Turkey Cartilage, Dried Kelp, Freeze-Dried Chicken Liver, Freeze-Dried Turkey Liver, Whole Pumpkin, Whole Butternut Squash, Kale, Spinach, Mustard Greens, Collard Greens, Turnip Greens, Whole Carrots, Apples, Pears, Pumpkin Seeds, Sunﬂower Seeds, Zinc Proteinate, Mixed Tocopherols (Preservative), Chicory Root, Turmeric, Sarsaparilla Root, Althea Root, Rosehips, Juniper Berries, Dried Lactobacillus Acidophilus Fermentation Product, Dried Biﬁdobacterium Animalis Fermentation Product, Dried Lactobacillus Casei Fermentation Product. Wellness Core are formulated with natural and wholesome ingredients, plus they contain a boost of super nutrients including omega fatty acids, antioxidants, probiotics, ad prebiotics. No artificial ingredients, flavors, colors or cheap poultry by-product meals are used in any of their products. Wellness Core grain free dog food makes the list of the top dog food brands that offer natural, grain-free formulas for many reasons. Their food are wheat, grain, corn, and soy free as well. They are high in protein, low in fat, and GMO free. The company uses delicious, real foods like de-boned meats that are free of added hormones and steroids, wholesome grains, and fresh fruits and vegetables to provide the ideal balance of energy, protein, minerals, vitamins, and antioxidants. This dog food also has added supplements including omega 3 and 6 fatty acids to give your dog a healthy coat and skin, glucosamine and chondroitin to promote joint health, and taurine for a healthy heart. They have recipes for every breed and size, and Wellness Core makes formulas for limited ingredient diets too. Ingredients: Deboned Turkey, Turkey Meal, Chicken Meal, Peas, Potatoes, Dried Ground Potatoes, Chicken Fat (preserved with Mixed Tocopherols), Tomato Pomace, Chicken Liver, Natural Chicken Flavor, Flaxseed, Salmon Oil, Carrots, Sweet Potatoes, Kale, Broccoli, Spinach, Parsley, Apples, Blueberries, Vitamins [Vitamin E Supplement, Beta-Carotene, Niacin, d-Calcium Pantothenate, Vitamin A Supplement, Riboflavin, Vitamin D-3 Supplement, Vitamin B-12 Supplement, Pyridoxine Hydrochloride, Thiamine Mononitrate, Ascorbic Acid (Vitamin C), Biotin, Folic Acid], Minerals [Zinc Proteinate, Zinc Sulfate, Iron Proteinate, Ferrous Sulfate, Copper Sulfate, Copper Proteinate, Manganese Proteinate, Manganese Sulfate, Sodium Selenite, Calcium Iodate], Choline Chloride, Mixed Tocopherols added to preserve freshness, Glucosamine Hydrochloride, Chondroitin Sulfate, Taurine, Chicory Root Extract, Yucca Schidigera Extract, Dried Lactobacillus plantarum Fermentation Product, Dried Enterococcus faecium Fermentation Product, Dried Lactobacillus casei Fermentation Product, Dried Lactobacillus acidophilus Fermentation Product, Rosemary Extract.This is a naturally preserved product. Made in the metro Milwaukee, Wisconsin area, all Stella & Chewy’s products are made at the company’s FDA-inspected plant. They work extremely closely with their network of suppliers to ensure the highest quality ingredients go into each of their products. In fact, all of their suppliers have filed letters of guarantee confirming that each ingredient is wholesome and fully compliant with federal regulations. Stella & Chewy’s grain free dog food contains raw complete and balanced nutrition. The options available to consumers are raw freeze dried food or raw frozen food. All their products are USDA-inspected and contain organic fruits and vegetables, as well as grass-fed beef, cage-free chicken, and wild-caught salmon. Similarly, all their formulas are free of hormones, steroids, and antibiotics. The natural ingredients are complimented by added minerals and vitamins that make each meal complete and balanced as determined by the American Federation of Feed Control Officials (AFFCO). Antioxidants and probiotics are added to each meal also. Raw diets can be risky, but if fed correctly they offer a number of health benefits for your dog including improved appetite and digestion, allergy relief, a healthier skin and coat, and a stronger immune system. The Honest Kitchen dog food is produced in a human food facility rather than a pet food plant. They make all-natural human grade pet food, meaning that their dog food is all manufactured, packed, and held in accordance with FDA federal regulations for human food. Their foods are made with dehydrated whole foods and include non-GMO produce, hormone-free meats, and other organic, fair trade ingredients. The Honest Kitchen grain free dehydrated dog food is the closest pet owners can get to homemade food. Surprisingly, employees of The Honest Kitchen taste-test all of the dehydrated pet food to ensure quality and taste. The company even produces some human foods, like muffin and cookie mixes, in the same plant right alongside their pet foods. Another benefit to this dog food brand is that some of their formulas have grains and others come grain free. Likewise, some of their formulas have meat and others do not contain any meat, so you have the option to add your own meat when preparing it for your dog. They have formulas for every diet! The Honest Kitchen even guarantees that their raw ingredients are tested and clear of things like E-coli, lead, melamine, mercury, salmonella, listeria, arsenic, yeast, and mold as well as pesticide residues, before even being allowed into the plant to be processed into dog food. Ingredients: Free-range chicken, organic flaxseed, potatoes, celery, sweet potatoes, apples, organic alfalfa, organic kelp, honey, pumpkin, green beans, cabbage, bananas, papayas, basil, garlic plus vitamins and minerals premix (premix includes tricalcium phosphate, choline chloride, zinc amino acid chelate, vitamin D3 supplement, vitamin E supplement, potassium iodide, potassium chloride, iron amino acid chelate, copper amino acid chelate). This grain-free, high protein, gluten free dog food has no corn and no soy. It is also abundant in vegetables and fruits. Makers of Taste of the Wild pet food believe that dogs and cats still have a natural desire to eat like their ancestors; wolves and wild cats. Their food provides your pet with the natural diet that they would find in the wild. Taste of the Wild grain free dog food is made with real roasted meats, and it is supplemented with fruits and vegetables. Their grain-free formulas provide an excellent taste and highly digestible energy. Their foods also offer natural antioxidants to support a healthy immune system and overall health. Likewise, because their food is a good source of omega 3 fatty acids, they will enriche your dog’s coat and promote healthy skin too. The company is the most popular among pet owners, is Amazon’s best seller for years, and this best grain free dog food formula is no different. It uses lean, natural meats like bison, venison, fresh smoked salmon, roasted lamb, roasted quail, duck, turkey, and a variety of meat protein sources like beef, lamb and wild boar. Their foods are also enriched with probiotics which are developed specifically for use in pet food and processed under strict human-grade standards. Another dog food that was inspired by the diet of wolves, Blue Buffalo’s Wilderness formula is the sixth best grain free dog food choice on the list. It’s void of all grains, high in protein, and low in carbohydrates. They have special blends of the Wilderness formula for puppies, adult dogs, and seniors. This formula is available in wet food or dry kibble. It is also available in a raw formula. Blue Buffalo’s Wilderness grain free dog food formula is made from chicken and turkey meal, which is the whole meat of birds and not the by-products. By-products do not offer your dog any nutritional value. They are just a filler with extra calories that your dog doesn’t need. This dog food also contains absolutely no preservatives, artificial colors, artificial flavors, corn, wheat, or soy proteins. Like many of the other top dog food brands on this list, Blue Buffalo’s Wilderness formula is supplemented with high quality vitamins and minerals to support and maintain your dog’s ultimate health and well being. The Wilderness formula is even available in dog treats so you can be sure your dog is get well balanced nutrition from every aspect of their diet. Ingredients: Deboned Salmon, Chicken Meal (source of Glucosamine), Peas, Pea Protein, Tapioca Starch, Menhaden Fish Meal (source of Omega 3 Fatty Acids), Dried Tomato Pomace, Dried Egg, Chicken Fat (preserved with Mixed Tocopherols), Pea Starch, Flaxseed (source of Omega 6 Fatty Acids), Natural Flavor, Dehydrated Alfalfa Meal, DL-Methionine, Dried Chicory Root, Potatoes, Pea Fiber, Calcium Carbonate, Choline Chloride, Caramel Color, Dicalcium Phosphate, Salt, preserved with Mixed Tocopherols, Sweet Potatoes, Carrots, Potassium Chloride, Zinc Amino Acid Chelate, Zinc Sulfate, Ferrous Sulfate, Vitamin E Supplement, Iron Amino Acid Chelate, Blueberries, Cranberries, Barley Grass, Parsley, Yucca Schidigera Extract, Dried Kelp, Turmeric, Nicotinic Acid (Vitamin B3), Calcium Pantothenate (Vitamin B5), L-Ascorbyl-2-Polyphosphate (source of Vitamin C), L-Carnitine, L-Lysine, Oil of Rosemary, Copper Sulfate, Biotin (Vitamin B7), Vitamin A Supplement, Copper Amino Acid Chelate, Manganese Sulfate, Taurine, Manganese Amino Acid Chelate, Thiamine Mononitrate (Vitamin B1), Riboflavin (Vitamin B2), Vitamin D3 Supplement, Vitamin B12 Supplement, Pyridoxine Hydrochloride (Vitamin B6), Calcium Iodate, Dried Yeast, Dried Enterococcus faecium fermentation product, Dried Lactobacillus acidophilus fermentation product, Dried Aspergillus niger fermentation extract, Dried Trichoderma longibrachiatum fermentation extract, Dried Bacillus subtilis fermentation extract, Folic Acid (Vitamin B9), Sodium Selenite. It may sound like a strange name for a pet food, but Addiction is one of the top dog food brands that offer natural, grain-free formulas. Using only natural, wholesome ingredients of the highest-quality they make blends for all sizes, breeds, and ages of canines. Their foods are packed with nutritional benefits to enhance the health and overall well-being of your pet. Addiction’s grain free dog food and their whole range of pet foods do not contain any artificial preservatives, flavors, fillers or by-products. They use wild or free-range meats that are not subject to growth hormones and steroids, including salmon, kangaroo, brushtail, unagi, venison and even eel. Pet parents can purchase Addiction foods in dry, raw dehydrated or canned options. In this eight best grain free dog food brand, because of the high protein content, it’s ideal for picky eaters, and perfect for pets that are allergic to some of the more common protein sources like chicken, lamb, or beef. Addiction is a holistic pet food, meaning they use only the highest quality ingredients combined with health-enhancing vitamins and supplements. Holistic pet foods have been found to aid in the prevention of pet diseases, particularly skin allergies and digestive problems, and help to enhance the natural lifespan of your pet. The Instinct brand by Nature’s Variety is inspired by a raw food diet. Their formulas combine poultry, fish, and meat protein with other simple, high quality, natural ingredients to provide a variety of forms, flavors, and textures for your pet. Instinct comes in frozen raw food, canned, and dry options for your dog. They also offer a variety of raw bones as well as turkey necks if you’re looking for healthy, natural dog treats. Nature’s Variety Instinct grain free dog food brand has an extremely high quality meat protein at 95 percent. Vegetables and fruits make up the other 5 percent. Nature’s Variety does not use grains or fillers in their Instinct formula. The blend offers complete balanced nutrition for each stage of your dog’s life. The free-range meats they use in their foods are antibiotic and hormone free. This eight best grain free dog food choice from Nature’s Variety contains high quality ingredient sources, and is protein-rich that will benefit your dog inside and out. You’ll be able to see a difference in their coat and skin, according to the company’s claims. You’ll also notice less issues with their digestion and an improvement in their energy. Reduced shedding is another benefit of a healthier diet. Ingredients: Chicken Meal, Tapioca, Chicken Fat, Pumpkinseeds, Menhaden Fish Meal, Sun-Cured Alfalfa Meal, Montmorillonite Clay, Natural Chicken Flavor, Vitamins (Choline Chloride, Vitamin E Supplement, Ascorbic Acid, Biotin, Niacin Supplement, Vitamin A Acetate, d-Calcium Pantothenate, Riboflavin Supplement, Pyridoxine Hydrochloride, Thiamine Mononitrate, Vitamin B12 Supplement, Carotene, Vitamin D3 Supplement, Folic Acid), Minerals (Zinc Proteinate, Iron Proteinate, Manganese Proteinate, Copper Proteinate, Sodium Selenite, Ethylenediamine Dihydriodide), Sea Salt, Dried Kelp, Direct-Fed Microorganisms (Saccharomyces Cerevisiae Yeast Culture, Dried Enterococcus Faecium Fermentation Product, Dried Lactobacillus Acidophilus Fermentation Product, Dried Aspergillus Niger Fermentation Extract, Dried Trichoderma Longibrachiatum Fermentation Extract, Dried Bacillus Subtilis Fermentation Extract), Inulin, Flaxseed Oil, Apples, Carrots, Peas, Cottage Cheese, Chicken Eggs, Mixed Tocopherols with Citric Acid (a natural preservative), Rosemary Extract, Freeze Dried Chicken, Freeze Dried Turkey, Freeze Dried Turkey Liver, Freeze Dried Turkey Heart, Ground Chicken Bone, Butternut Squash, Broccoli, Lettuce, Spinach, Salmon Oil, Apple Cider Vinegar, Parsley, Honey, Blueberries, Alfalfa Sprouts, Persimmons, Olive Oil, Duck Eggs, Pheasant Eggs, Quail Eggs, Rosemary, Sage, Clove. Preference dog food is actually a brand from The Honest Kitchen. It is a grain-free, gluten-free base-mix made with sweet potatoes, coconut, pumpkin, celery, peas, cabbage, and more. Using this mix is an easy way to make homemade dog food in your own kitchen. Preference is another of my top dog food brands that meet human grade requirements. Preference grain free dog food brand is also meat-free which makes it one of the best grain free vegetarian dog foods out there. You have the option to add your own meat when serving it to your dog, but it is also offers complete nutrition on its own if your dog cannot eat meat. This food contains the essential nutrients, vitamins, and minerals that are required for maintaining the best overall health for your dog. Preference’s ninth best grain free dog food brand is great for pets who can’t have grains or gluten, can’t tolerate common proteins, or can’t have white potatoes. This food is also dehydrated, which means the nutrients are concentrated so pet owners need to add water to the food. It comes in 7-pound boxes, but once mixed actually provides you with 29 pounds of food. As the last pick of best grain free dog food choices on the list, Dr. Harvey’s Canine Line gives pets the very best all-natural and organic foods, supplements, and treats. The company only uses 100% human grade ingredients, a common trend on this list of natural, grain free top dog food brands. This is also a meatless formula where you add your own meats if desire. Dr. Harvey’s adds no dyes, preservatives, chemicals, artificial, or synthetic ingredients. Like The Honest Kitchen blends, Dr Harvey’s grain free dog food brand can even be consumed by you, as the ingredients are human grade, natural and wholesome. Not only is this food a great choice for dogs with allergies and sensitive stomachs, it’s also a good choice for canines with weight issues. There are no sugars, fillers, corn, wheat or soy in Dr. Harvey’s dog food products either. Dr. Harvey’s is a freeze dried formula, much like Preference, so all you need to do is add water and your pet will have a well balanced meal. You can also add your own meat, fruits, vegetables, or supplements. It is one of the last best grain free dog food formulas with high quality vitamins and minerals to nourish dogs in all stages of life. The company offers multiple formulas to provide pet parents with many options to fit their dog’s needs, those with sensitive stomach and give them more control over what they are feeding. The above list of best grain free dog food recipes contains industry’s top rated grain free dog food brands based on their ingredients list, dog food recall history and as rated by pet owners and recommended by vets. However, some of these brands may not work well for certain dogs, especially if you have a picky eater or a dog with food allergies. Below are 40 alternative cheap grain free dog food brands that may fit your requirements and your budget much better. This is a protein rich kibble with 34% protein with that protein coming from salmon and ocean fish. There’s a lot to love about this food in addition to it being grain-free, we particularly like that it has no chicken by-product meal or artificial colors, flavors, or preservatives. We also love that the protein source of this food is fish which is rich in omega fatty acids which is great for those joints. There is a lot to love about this grain-free dog food choice, not only is it affordable, but it’s a food that you can pick up in all of the big name pet stores so you’ll never run out of food and have to wait for a shipment to come in. Made with sweet potatoes and pumpkin, this is a good choice for grain-free dogs with sensitive stomachs and it contains no beef so it’s a good option for dogs with a beef allergy too! Price: $38.99 / 25 lbs. Nutro MAX is another brand of dog food that is easily available locally and it’s an affordable grain-free choice too. If your grain-free dog has trouble with a sensitive stomach, the lamb protein in this food will help to keep their stomach settled. We love that this formula is made with digestive, skin, coat, and immune health in mind – it’s a great option for the pet parent on a budget with a very food sensitive pup! We aren’t thoroughly convinced, but since the release of her newer formulas, pet parents are convinced of the benefits of Rachael Ray’s Zero Grain formula. The salmon and sweet potato formula contains no grains or gluten and no poultry by-product meal which can be hard to find! We like the price point on this kibble and based on the opinion of more than 300 pet parents, we’re including it on our list of best grain free dog foods. Another Rachael Ray food choice that comes highly recommended by grain-free pet parents is the PEAK Grain Free Northern Woodlands Recipe. Made with 30% protein from high-quality protein sources, this grain and gluten-free food option also contains vitamin-rich peas, potatoes, and sweet potatoes starches. We also notice that Rachael Ray frequently offers coupons on her foods when you purchase through Amazon so you can end up saving an extra 10%! Although this is a Merrick brand food and they have had a number of recalls in the past, this is another food that we included on our list of best grain free dog food brands based on pet parent recommendations. Made with pork, beef, and lamb, this grain-free formula is completely poultry free and it’s also fortified for skin health, coat health, and digestibility. “I and love and you” is a brand that a lot of pet parents haven’t been introduced to yet, but their Naked Essentials line is a great protein-rich, grain-free dog food option. Made with garbanzo beans and sweet potatoes, this formula has 30% protein and is fortified with digestive enzymes, prebiotics, and probiotics for a happy tummy. What we love most about this food, though, is that for every bag you buy, five meals are donated to dogs and cats in need! We like the Nature’s Variety Instinct kibble option because it incorporates raw feeding into kibble making some of the raw feeding benefits available to pet parents on a budget. This is a food that’s made with easy to digest ingredients, but what we absolutely love is that it contains no corn, wheat, or soy AND no dairy, eggs, or potato. It’s hard to find foods that are formulated without all of these common allergens, so this really is a diamond in the rough for parents of allergy-prone pets. This isn’t the most affordable among the best grain free dog food options listed, but it’s a high-quality food that made with whole fish and poultry rather than rendered meat products. We love Halo brand for that fact as well as for the fact that they source ingredients from farms that humanely raise their animals and they only use non-GMO fruits and vegetables. This may seem a little excessive to some pet parents, but as a pet parent who has fed an allergy-prone dog with hemangiosarcoma, I can tell you that every little thing in your dog’s diet can make a positive difference! Another grain-free dog food from Nature’s Variety Instinct, this food has the same benefits as the limited ingredient turkey formula but is a better option for dogs with sensitive stomachs and digestive systems as it uses lamb as the single protein source. Another limited ingredient formula food, Natural Balance Limited Ingredient foods have made quite a few of our food recommendation lists because of their unique formulation. This is an easily available food at most pet stores which is always a plus and it’s not a calorie rich food choice which makes it a great choice for your more sedentary pups too. However, it might be too expensive for people looking for cheap grain free dog food brands, and there are more affordable alternatives. Wellness is another brand of food that you will see frequently on our recommended best grain free dog food lists. If you’re looking for a grain-free food for your small breed dog, this is a great go-to from a reputable brand that is made only in the USA. We love that this food has no meat by-products and that, like all Wellness foods, it’s covered by the Wellness Guarantee to give you peace of mind. Price: $54.99 / 22 lbs. A grain-free dog food that comes highly recommended by other pet parents, Avoderm Natural with Turkey is formulated with avocados for plenty of those great omega fatty acids. Made with no by-products, this is a great food choice if you want to feed a rotational diet to your grain-free allergy-prone dog. The one concern we have with Avoderm foods, however, is that they seem to be getting harder to find in local stores so it’s worth checking your local stores before making a switch to this food. If you prefer to stay away from more traditional kibble options and feed your dog a dehydrated diet, we recommend checking out Spot Farms dehydrated grain-free chicken food. Made with human grade ingredients and using antibiotic-free chicken, we can’t say enough good things about a dehydrated dog food option, especially if you’re on the road and don’t have much space to accommodate a huge bag of kibble. Nulo grain-free salmon recipe food doesn’t just leave out the grains, but they also leave out the gluten, soy, egg, and chicken proteins just to be sure that your allergy-prone dog is comfortable. We love that Nulo is made in the USA, but what we love most about this food is that 80% of the protein content comes straight from animal-based proteins. One of our most recommended brands of kibble, Earthborn receives far fewer kudos than they deserve for never having to recall one of their foods. When it comes to best grain free dog food options, we like Earthborn’s Coastal Catch recipe because it’s loaded with joint and heart healthy omega fatty acids which are ideal for seniors and active dogs alike. Another fish-based grain-free dog food option, Nulo Senior Grain Free trout and sweet potato food is not ideal for all seniors, but if you have a grain-free pup who could use an immune system boost and has to avoid chicken and eggs, give this recipe a try and see how it does for your senior! A grain-free and poultry free dog food, this Natural Ultramix formula is made with real salmon and incorporated real pieces of fruits and vegetables. We like that this is a food that’s made in the USA and that they also include prebiotics to aid in healthy digestion. Rich in fiber and antioxidants, too, this may also be a good option for your healthy senior who could use a higher fiber food choice. Holistic Select grain-free turkey formula is a USA-made kibble that contains no meat by-products, wheat, wheat gluten, or artificial colors or flavors. We like this affordable kibble option because it includes pre and probiotics, yogurt cultures, digestive enzymes, and natural fiber, all of which contribute to a very healthy digestive system which is particularly beneficial in senior dogs. Ziwi Peak air-dried lamb dog food is not ideal for pet parents on a budget, but if you’re looking for a high quality and truly single-sourced food, this is it. Made from free-range, grass-fed, ethically and sustainably farmed lamb from New Zealand, this is a 95% digestible food which means smaller daily meals and less waste to pick up! Although this is an expensive food option compared to many other best grain free dog foods listed, you can make it last longer by using it as a topper on top of your favorite grain-free kibble. Grain-free and gluten free, this kibble formula uses lean bison protein for low calorie, top quality protein. What we love most about this grain-free dog food, though, is that it comes in a completely resealable bag. It might sound ridiculous, but when you purchase large bags of kibble, that seal on the bag offers an extra layer of protection against humidity and food getting stale. Made with grass-fed beef, Castor and Pollux grass-fed beef and chickpea food uses responsibly sourced ingredients, is cooked in the USA, and uses no artificial preservatives or flavors. We love the variety of protein that is available in this line of food – grass-fed beef, wild-caught salmon, grass-fed lamb, and free-range chicken and turkey – all of which provide high-quality protein that you can rotate to provide plenty of variety in your dog’s daily diet. A holistic, natural kibble made with fresh salmon, this Solid Gold formula is formulated specifically for grain-free dogs with sensitive stomachs! Free from chicken protein, corn, wheat, soy, artificial colors, artificial preservatives, and fillers, this is a USA-made and guaranteed food with plenty of omega fatty acids, and a perfect option among other best grain free dog food brands, albeit more expensive. The newest trend in kibble is to combine many of the benefits of raw feeding with the convenience of kibble feeding and that’s what Wellness Core RawRev is designed to do. A high protein, grain-free dog food, this formula is also free from potatoes and gluten-free as well. Made in the USA, we like this kibble for the convenience of their “raw bites” combined with high-quality kibble for a more nutritious food option. Victor premium grain-free dog food with salmon and sweet potato is both affordable and high in protein. With 33% protein content, this kibble relies on USA sourced fish and is approved for feeding to all life stages with the exception of large breed puppies in the growth stage. Like many of our favorite kibble choices on this list of best grain free dog foods, this food is supplemented for immune and digestive health! Orijen Tundra grain-free dog food is formulated using whole prey ratios with freeze-dried liver to increase palatability for the pickier eaters out there. We like Orijen products overall, but the thing we like most about this formulation is the inclusion of muscle meat, organs, cartilage, and bones in the meat content for more well-rounded nutrition. We don’t recommend this option for dogs sensitive to proteins, however, since it incorporates goat, wild boar, venison, Arctic char, free-run duck, and mutton. 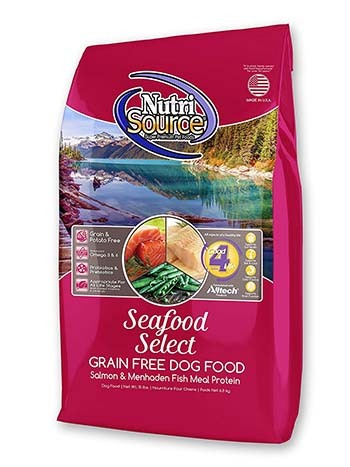 Made with salmon, the Nutrisource Select Grain Free Seafood formula is suited to all life stages. In addition to being grain-free, this kibble is also potato free and incorporates prebiotics and probiotics for healthy digestion. Made in the USA, this is another cheap grain free dog food choice that comes highly recommended by pet parents everywhere (particularly those on a smaller budget). Another great grain-free dog food option for pet parents looking to feed a freeze-dried diet, Sojos grain free turkey food mix is a convenient solution to better nutrition. We love that this food option rehydrates to make 40lbs of food without having to lug around a 40lb. bag of dog food and of course, we also love the fact that it’s made with only premium ingredients. This PetCo. exclusive grain-free dog food is an affordable solution to feeding grain-free on a budget. Formulated for a healthy immune system, this food is approved for all life stages and uses chicken as the main protein source. While this is a good cheap grain free dog food option, keep in mind that it is exclusively sold by PetCo. so you are limited in where you can pick this food up and if you forget to reorder on time, you may need a backup food option! The Honest Kitchen is one of our favorite dog food choices for families interested in feeding a homemade type of diet. Completely grain-free, the fish limited ingredient food from Honest Kitchen includes six basic ingredients: pollock, coconut, chickpeas, celery, pumpkin, and spinach. We love that Honest Kitchen uses human grade foods and that making their food is as simple as just adding water! Wag is the Amazon brand of dog food that was recently released and it quickly hit many vets’ list of best grain free dog foods. Their food formulas are advertised as having no added grain and their beef formula is a nice addition to the unique protein dog food market. We like the price point on this grain-free food choice, but as with the PetCo. exclusive brand, this food is only available in a single store which can lead to problems if you don’t reorder food on time! Another Earthborn food choice, the Grain Free Meadow formula is both grain free and gluten free and relies on lamb as it’s source of protein. We love that Earthborn ensures that their packaging is all BPA free and like many of the other Earthborn food choices, this one comes in a resealable bag. We also like the smaller kibble size of this food which makes it easier for smaller dogs to eat too! PS For Dogs is one of the best grain free dog food brands that few average pet parents are familiar with, but if you have a dog prone to itching and licking, you’ll be glad you tried their lamb formula. This food is designed specifically for dogs with allergy concerns and uses grass-fed free-range lamb as it’s the main source of protein. This is an air-dried dog food which some pet parents feel uncomfortable with, but we can’t recommend it enough if your dog is currently loaded up on allergy medications! Another one of the cheap grain free dog food options from Canidae, the PURE Ancestral salmon, mackerel, and Pacific whiting formula has no grains, no potatoes, no red meat, no chicken, and it includes 17lbs. of fish ingredients which means plenty of great omega fatty acids! This formula includes a freeze-dried raw coating which our dogs seem to find especially palatable! Pure Vita Grain Free salmon and peas limited ingredient formula uses a single source fish protein making it very allergy-friendly, and it’s both grain and gluten-free. We like that this food incorporates superfoods like cranberries and blueberries as well as L-Carnitine for optimal cell function which is beneficial for dogs of all ages. You will find this food in a turkey and sweet potato recipe as well, but of the two, we prefer the salmon and so do our dogs!